Blood oranges are coming in to season, with the trees bearing rich vitamin infused fruit from August through to October. Reading the description below brings back vivid memories of the 8 years my family spent in Griffith NSW. 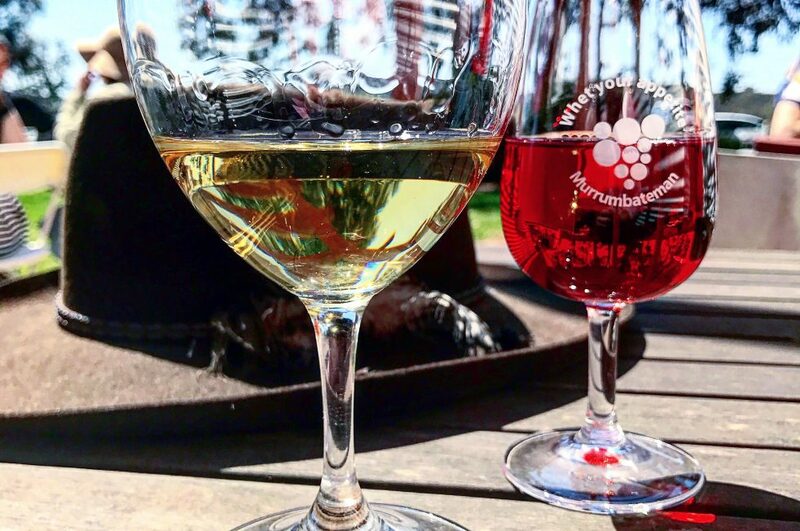 Orchards of rich soil, bearing trees laden with ripe fragrant citrus fruits and their flowers, vineyards that seemingly went for miles, their vines bulging with grapes, of many varieties, giving off a weird, but somehow comforting smell of sultana’s and fermentation. As a kid growing up in a small country town with many different cultures, it was magical; the food, the smells, the accents, the languages, the laidback attitudes, the gossip with the neighbours. Riding our bikes til the sun went down, wickedly nicking mandarins, oranges, plums and table grapes off the Nonna’s trees as we rode past. I have serious bouts of nostalgia every now and again and wish I could just pack my young family up and move them right back to the roads of red dirt, with the pungent smell of fermenting grapes and oranges in the air, so they too could have the joy of living in a regional country city. This box of blood oranges smells like Griffith. The oranges are grown on our two orchards based in the fertile Murrumbidgee area of the Riverina. Our aim is to provide you with the best blood oranges you have ever seen or tasted. Our company roots were set way back in 1950s Italy with our grandfathers, Vito Leonardo Mancini, and Guiseppe Barbagallo who both established orange orchards in the 1960’s in Griffith NSW. Len also remembers his grandfather Vito Leonardo bringing home boxes of oranges and inviting him to cut them. “The first time I cut them as a very young boy and saw the blood coloured juice coming out of them I was shocked if not downright frightened. Nonno thought that was pretty funny. It wasn’t long though before I was hooked on them, even as a kid”. From these humble beginnings, the seed of Redbelly Citrus was planted. Some twenty years later, Redbelly has invested in the latest in agricultural technologies and planting techniques, and have over 32,000 trees planted to date. Our orchards were established in 2005 and continue to mature and increase in production. We are passionate about blood oranges and hope to spread that passion far and wide with the supply of these most majestic of citrus varieties. I read somewhere that the blood orange fell out of fashion in the 60’s and they practically disappeared. People only wanted the sweeter orange flesh of the navel and other varietals. I can’t remember where I read that? Madness, just madness. 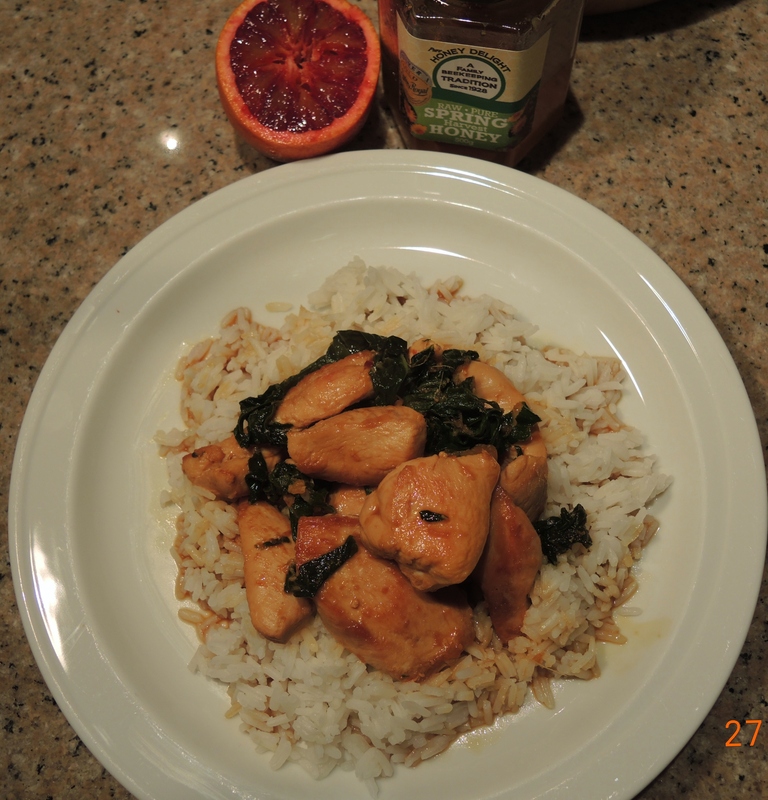 After Tweenie and I devoured one each first, surprised at the slight tartness, but still delicious, Tweenie declaring that she now prefers them over the sticky sweetness of her previous fav citrus, the mandarin, the first thing I did with my oranges, was to cook a sticky ginger and blood orange chicken stir fry with spinach and rice. Perfect opportunity to also use my honey from Honey Delights. 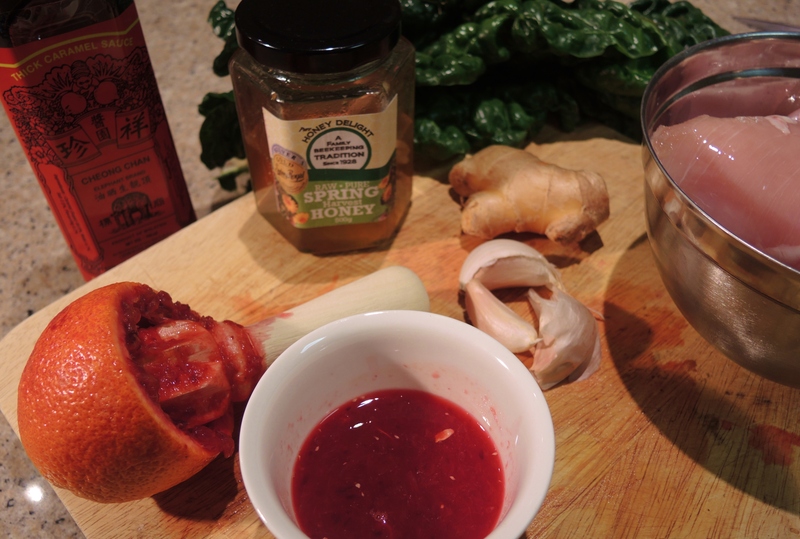 Add the garlic, ginger, juice, soy, caramel and honey in a bowl and mix together until all combined. 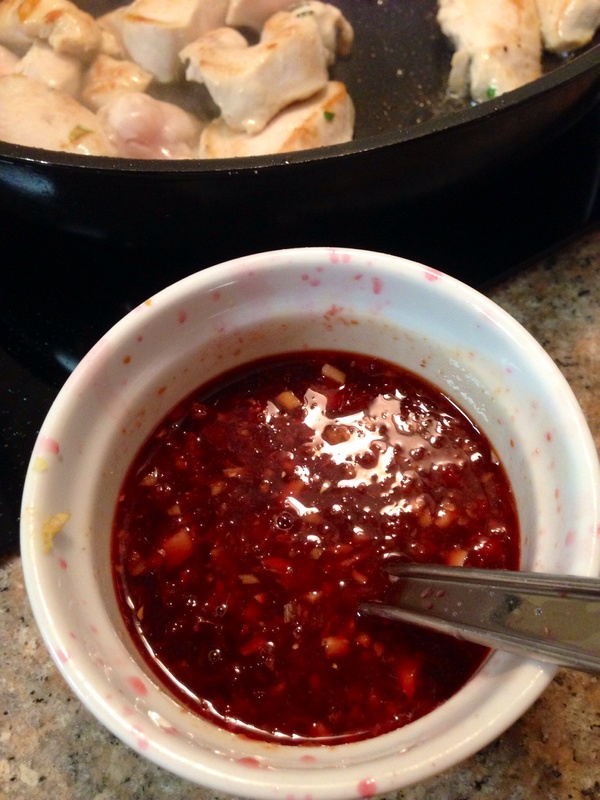 Fry the chicken until just cooked through, and tip onto a plate. Fry the spinach and also tip out into a bowl. Add the sauce to the pan and let it bubble furiously for a few minutes, this cooks the garlic and ginger and will caramelise the sugars in the sauce. Add the chicken and juices back to the pan and stir til all gloriously sticky with the sauce, add the spinach and season with pepper and salt if you think it needs it, and a little water if you think it’s a bit dry. I added a little extra blood orange juice to give a little more tang and colour. 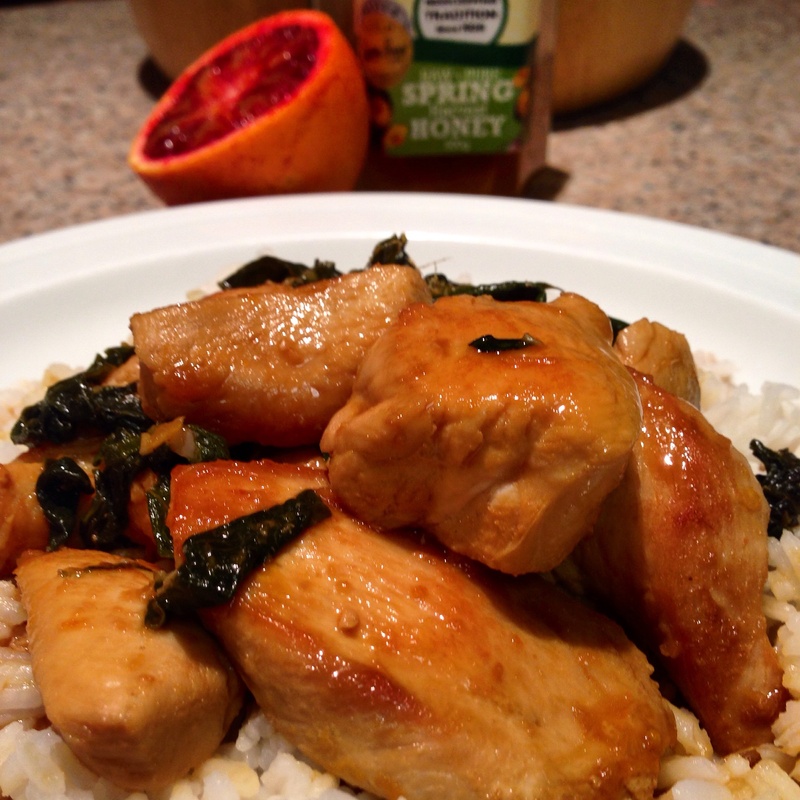 Take your steamed rice out of the microwave, and pour over the chicken and all it’s caramelised sauce. Enjoy. Now to the new camera. I bought a Nikon Coolpix7800 to take overseas with me and also to start getting a little more serious with my photographs for my blog. And I have to say, I’m a bit disappointed with the results. It could very well be the user and not the equipment, as I will admit I haven’t yet read the manual. Can’t you just hit Auto and the camera takes awesome pics? No? The photo’s above are a mix of both my iPhone and my new camera, and I can’t really tell the difference. Can you? Thats a shame about your camera, hopefully with some manual reading you’ll figure it out and find a way to take stella snaps. So glad that you’re enjoying the blood oranges, Fran… your new camera might take a while to get used to, but you’ll get there. Liz, I just need to read the instruction manual on the camera, I’m sure that’ll set me straight. And I certainly am enjoying the blood oranges, thanks so much! You really are making me homesick with some of these posts Food Marshall. Very jealous I am not there with you to sample some of your goodies. Enjoying living vicariously through you. Only a couple more months to go and we’ll be able to celebrate anything and everything together!